Police Officers Association President Martin Halloran (right) announces the union’s endorsement of Angela Alioto (left) for mayor. San Francisco’s bellicose police union today officially announced it is endorsing mayoral candidate Angela Alioto. 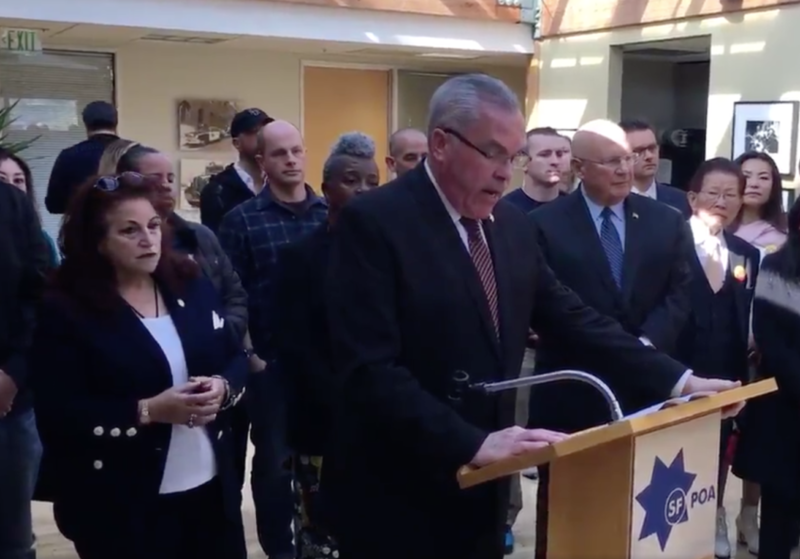 The language at today’s press conference did not match casual discussions in recent weeks with Police Officers Association officials, who essentially told us: To hell with it, we’re gonna probably endorse Angela Alioto. To hell with it, they did. Ideologically, this makes plenty of sense. Alioto, a former board president, successful civil rights lawyer, and the daughter of former mayor Joe Alioto, is uncompromising. She is not an equivocating politician, nor one to modulate her positions. That sounds a lot like the POA, which has increasingly become a municipal anachronism and reactionary force. And, depending on whom you speak with, the same terms could be applied to the POA’s chosen candidate. Alioto is the closest thing this race has to a law-and-order candidate; while every other mayoral aspirant eventually came out against the POA-backed Taser measure, Alioto is emphatically for it. “LOL, yes I signed it at the MLK breakfast,” she texted me. The cops’ union contract is currently being negotiated with the city under the watch of Mayor Mark Farrell — long a reliable POA ally — so the union, for years, may not need to return cap in hand to whomever wins June’s election. That potentially frees the POA up to do as it pleases, even more than the wealthy and aggressive union would have been wont to do anyway. And what the POA felt inclined to do was take yet another shot at London Breed, their erstwhile favorite politician turned target of personal animus. (The POA differed with Mark Leno on transparency-related policies he pursued in Sacramento; policy differences do not make for the incendiary conditions of personal relationships gone sour. The POA doesn’t give much thought to Jane Kim whatsoever except to come up with new synonyms for “left-wing radical” to apply to her). Breed earlier this year scored the coveted firefighter union’s endorsement. Unlike the firefighters, the police do not walk precincts for their chosen candidate. They do not knock on doors. They do not have the overwhelmingly positive societal position of firefighters. And they do not have as mighty an independent expenditure campaign as the firefighters, who figure to spend heavily and serve as a conduit for “dark money” from any manner of wealthy political backers. But the POA does have a goodly chunk of change, and a provably devil-may-care attitude toward spending it. The union might, one strategist supposes, “use the Taser campaign to highlight or diminish other mayoral candidates.” Expect an “air war” and possible mailers both pushing Alioto and, perhaps, denigrating her opponents. One guess as to who gets denigrated the most. Alioto, barring a vast miscalculation by every last vestige of political thinking in San Francisco not named Alioto, will not win in June. But she may yet siphon away those conservative, West-side votes other candidates — again, guess who — desire. In the end, if enough voters join with the POA in announcing: “To hell with it, I’m voting for Angela,” that might be enough to alter the race. And, maybe, that’s enough for the POA. NextKink.com estate sale at the Armory: How much for the torture rack? She is by far the best candidate and I’m tired of the local media trying to downplay that. I agee. Our city has been spending so much money on our homeless problem and we’ve got nothing back in return. Time to take our city back. She has my families 4 votes. She is one of my choices which would surprise some people as I usually vote way left of the Democratic Clubs. This is a candidate with an excellent record as a Civil Rights attorney who promoted woman’s rights as a supervisor and who did work on homeless solutions. She and her family have roots in SF and know and lived our history. I see her support from the police as an acknowledgement of that. Voting based on strategy may have some value, but in this City it is overdone. Voting out of principle is the real San Francisco way. At one point, San Francisco was considered “friend of the authentic” which is why so many people who needed a place of safety flocked here. Now that has become “old school” to those who moved in for that reason but are too new and self involved to know what produced our culture.